Bring joyful moments into the lives of your dearest ones with this Treasured Fall Fantasy Fiesta Assorted Bouquet and let them cherish it for lifetime. 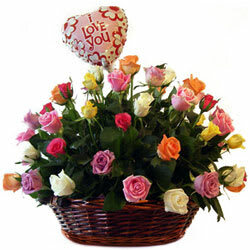 This vibrant Arrangement of Flowers exhibits 40 Mixed Roses presented in a beautiful Basket with a Balloon. Bring joyful moments into the lives of your dearest ones with this Treasured Fall Fantasy Fiesta Assorted Bouquet and let them cherish it for lifetime. This vibrant Arrangement of Flowers exhibits 75 Mixed Roses presented in a beautiful Basket with a Balloon.